How will speed, momentum, torque, friction, gravity, and work impact your ride? Join our next Nerd Night to answer all of your questions about the physics of cycling. While nibbling on a savory flatbread and fresh salad in a newly renovated downtown space, you have the chance not only learn bike science, but also compete for prizes via the indoor training Watt Challenge! Podium Finish will have multiple indoor training bikes and screens set up to see who can generate the most Watts in a 30 second window. Learn about the Dynamics of Cycling from one of the foremost cycling AND physics experts in the Border Region. Dave has worked in both Bio-mechanics and Exercise Physiology laboratories at UTEP and participated in numerous physiology studies. Avid competitive cyclist, Dave Wilson, has been cycling his entire life. Son of a biomechanist, cyclist, and cycling / track coach, Dave grew up with cycling and science. 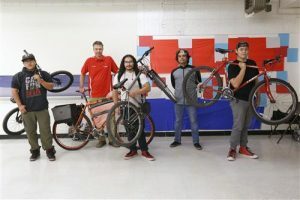 He not only teaches Physics at Irvin High School and runs his own company, Nuclear Sunrise Stitchworks, but also started a student-operated community bicycle co-op with college Mario Hurtado. This Co-op was formed with a goal of technical education, to give kids the skills they’ll need to have transportation freedom via a functioning bike. They’re always in need of donated bikes and parts, if you would like to make a donation to Irvin High School’s bicycle co-op, please bring them to this Nerd Night! A huge thank you to Podium Finish Sport Boutique and Cafe for sponsoring and hosting “The Dynamics of Cycling.” Part coffee shop, part restaurant, part sport boutique, part indoor training facility, and part bike repair shop, Podium Finish is a unique new addition to Downtown El Paso. If you have not yet had a chance to check out all of the neat treats offered by Podium, you ‘ll get a chance to see what they’re all about on March 30th.